As technological advances are made and the world moves towards automation, it is becoming clearer that a definite set of rules and regulations are necessary to ensure the protection of on-site staff and nearby equipment. The European Machinery Directive has been put to task, and it has implemented a series of risk assessment procedures, enhancing the safety of industrial machines. Similarly, in Germany, the Industrial Safety Regulation, requires all operators to regularly perform maintenance checks and fit-in safety technology wherever necessary. The operator should be fully aware of all the relevant risks of a piece of machinery. In addition, he/she should have a complete documentation of all the hazards it may pose for the workforce. This step involves the estimation of the degree of risk that every hazard constitutes. For instance, listing down the severity of the injury would be counted as risk evaluation. Minimizing risk is necessary for manufacturers because the primary purpose of machines is to make lives easier and safer for human beings. If this is not possible, then the entire concept of automation is defeated. 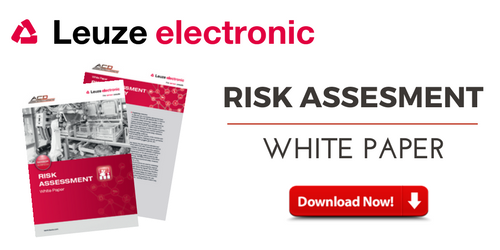 The ISO12100:2010 standard illustrates the approach necessary for minimizing risks. To prevent risk from sprouting in the first place, all possibilities of making amends during construction must be utilized. Technical measures can’t be taken until all possibilities for altering the construction or the process itself have been taken. Once taken, technical steps such as hard guards, hoods, guarding, flaps, etc. should be installed to act as a first line of defense. After all possible protective devices have been installed, and risks still surface, then the operator must install warning messages and markings. Manufacturers should clearly make these risks visible in their products’ documentations so that the operator knows the precisely which part is most dangerous. These fall on the operator as well, and include the availability of protective devices such as helmets, goggles, gloves, etc. on-site. Appropriate testing and estimating of risk must be carried out for every single hazard that exists in the workplace. It is to be noted that the above-mentioned safety measures do not have a PL or SIL. Typically, all machines and assets have to go through detailed assessments, so that the best possible response can be issued in the face of a hazard. However, there are no such explicitly defined processes that would completely dictate the assessment procedures. Therefore, the burden falls on the operator/planner, which makes the entire process a lot more difficult. The risk of a hazard are devised by the following set of risk parameters, which when combined provide the degree of risk. There are several possible methods for carrying out risk evaluation. This is a computational method, where a number of assessments are carried out per parameter. Up to five values are available per parameter. Here’s the table for the “O” parameter. Similar tables exist for other parameters as well. The individual risk parameters (F, P & O) are added resulting in Risk Class K. Combined with the severity (S), the required SIL of a safety function may be calculated. In this method, a relatively higher number of assessments are specified, compared to the previous one. The value ranges are also specified for individual parameters, allowing greater flexibility. Also, the effects on more than one person can be studied through the “N” parameter, which takes into account the workers in danger. The major advantage of carrying out multiplication in devising the risk is that whenever one of the independent factors becomes small, the risk goes down as well. However, this method is insufficient for carrying out assessment of control technology related measures, which gave way to another method called HaRMONY. Adaptation of risk assessment according to the ISO 13849-1 and IEC 62061 standards. Severity (S) is determined on a scale of 0.01 to 20, from no injury to death respectively. The value 0.01 allows completion of a risk reduction process according to ISO 12100 standards. The Exposure Parameter E, determines the duration as well as the frequency of hazard, ranging from no-hazard to permanent-hazard. However, multiple values are provided to the user, in case easily avoidable hazards need to be considered. For instance, the installation of optical protective devices in crushing or shearing machinery can significantly reduce risk of injury. This would reduce the duration of exposure to risk from permanent to a few milli-seconds, but they would still require consideration in the final equation. Other parameters that are also included are Occurrence (O), Avoidance (A) and lastly Number (N). The last parameter is of great importance as it allows multiple lives to be considered near a hazardous machine. It ranges from 0 for no-one to 12 for 50+ personnel. For machine safety, it is usually set as 1. In areas where several people’s lives may be put at risk, e.g. train crash, explosion, etc. the parameter must be set to a higher value. The 0 value can be assigned only if the machine/asset is completely isolated. The degree of risk is then jotted down both in terms of ISO 13849-1 as well as IEC 62061/61508. The highest degree of risk is set as R>30,000, with the assessment being catastrophic and SIL level being 4. S=15, as loss of 2 or more limbs. E=20, since there is permanent exposure. The final assessment of risk according to these values will be R = 22,500, that falls within PL-e in terms of ISO 13849-1 & SIL3 in terms of IEC 62061/61508. Special protection systems such as brakes. The risk can be brought down to an acceptable level. In conclusion, using the HaRMONY method for risk assessment, almost all parameters that are hazardous to personnel may be quantified. As a result, appropriate actions may be taken, resulting in greater safety and compliance with standards. 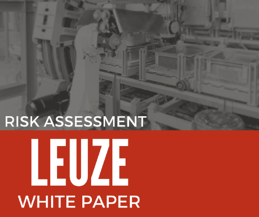 Interested in learning more about Leuze Electronic products?